This steel consists of two different hardenable steel grades in more than one hundred layers. The steel becomes stainless after heat treatment. It combines corrosion resistance with superior edge sharpness and toughness. It is an excellent steel for edge tools such as knives. Several patterns are available. The most popular steel grades for knife making are the Damasteel® DS93X™ Martensitic Damascus Patterned Steel and Damasteel® RWL34™ Martensitic Steel. What are the main advantages of Damasteel® ? Damasteel® is the best performing stainless Damascus steel in the world using the latest gas-atomized PM technology with very high cleanliness. It has incomparable toughness and strength combined with excellent edge retention and corrosion resistance. This allows for a very user friendly Damascus steel that is made to be abused. 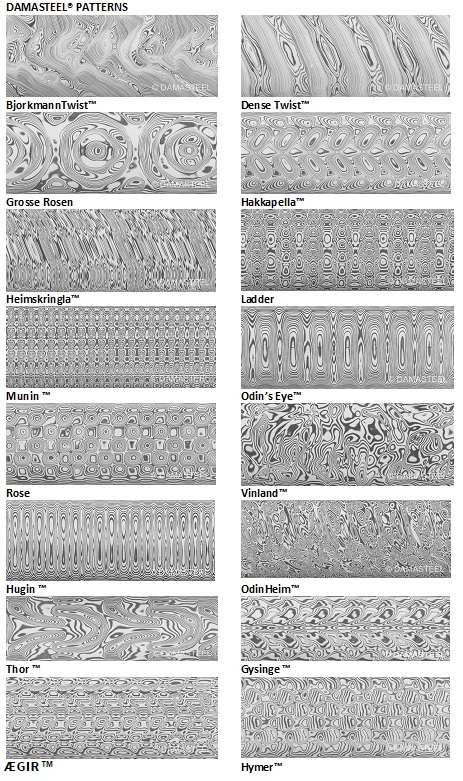 For the manufacturer the highest quality combined with consistent patterns makes Damasteel® very easy to work with. A Damasteel® martensitic stainless knife blade heat treated to 60 to 62 HRC will be a reliable hunting knife to be used under the most demanding conditions while also displaying the beauty of a Damascus pattern. As an example of its strength the Damasteel® product is used in some of the most sophisticated and expensive shot gun barrels made in the world. However the Damasteel® product is also used for chef’s knives, utensils, jewellery, watches and many other areas solely because of its beauty.